Universal 3D: This format displays as 3D data. SMG: displays an SMG file in an embedded SOLIDWORKS Composer player. Preview image: displays as a 2D image. 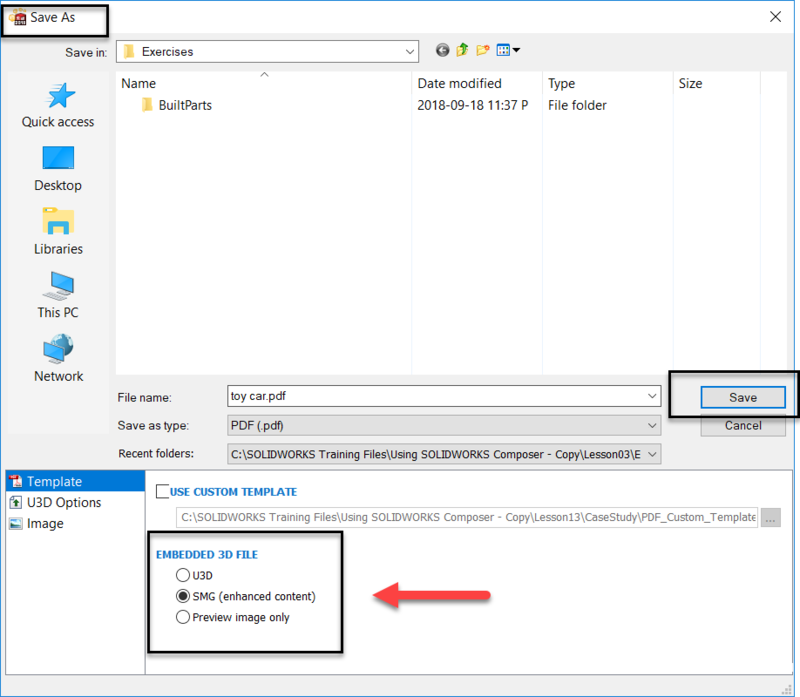 In this blog article I will talk about the steps of how to embed composer player file (3D content) inside an Adobe PDF (Reader). We would need Adobe Acrobat plug-in to view the PDF files containing SOLIDWORKS Composer SMG enhanced content.This plug-in is automatically installed with SOLIDWORKS Composer or SOLIDWORKS Composer Player. If your colleagues do not have composer or composer player installed on their machine they will not be able to view content in this PDF file. So, you will have to share this plug-in files with them, to view this PDF. This add-in works with either Adobe Acrobat or Adobe Reader version 7.0.7 or later. 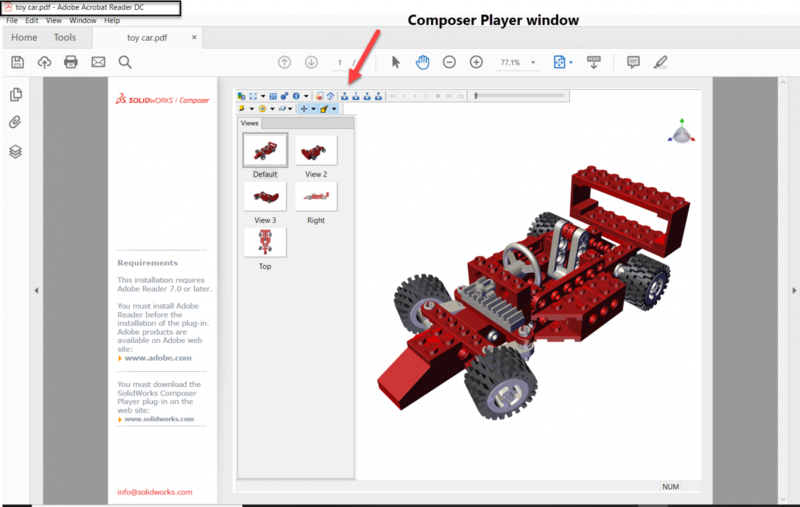 When we install Composer or Composer player, plug-in files composerplayercontrol.dll and composerplayerreader.api are installed along, in the composer installation directory < C:\Program Files\SOLIDWORKS Corp\SOLIDWORKS Composer\Plugins\acrobat\reader\plug_ins. This is default installation location.If you are using the writer then copy the files from writer folder. Copy all the files to the adobe directory <C:\Program Files (x86)\Adobe\Acrobat Reader DC\Reader\plug_ins. Now Go to File > Publish > PDF and select SMG (enhanced content) for embedded 3d file > Save. Now open the PDF file in Adobe Reader. Click on the image to start composer Player inside the PDF file. You can zoom, rotate, switch views and play the animation within PDF file. Attend a SOLIDWORKS Composer training course either in a Canadian classroom near you or live online. For more information about composer software and training solutions call 1-877-219-6757.